In every Twin Cities home, your water supply and plumbing works perfectly, most of the time. When it doesn’t, though, homeowners and landlords often try simple methods to deal with the problems. All too often, though, home plumbing remedies just don’t do the job. That’s when it’s time to call our handyman service. Our highly skilled network of licensed plumbers have the knowledge, skills, and tools needed to handle the full range of plumbing problems in any home. Leaky Pipes & Valves – Plumbing leaks aren’t just an annoyance. Leaking plumbing can damage your home in many ways and may increase your water bill. Our plumbers will fix the leak correctly and permanently. Plugged or Slow Drains – When plungers and drain cleaners don’t do the job, call our full-service home repair company. From plugged toilets to slow running sink drains, we have the right tools and equipment to clear them. Sewer root removal is also available, if needed. Drain System Replacements – If you have leaky sink, tub, and shower drains or drains that are constantly clogging, we can completely replace that old drain plumbing quickly at an affordable cost and solve your drain problems. Leaky, Dripping Faucets – Our skilled plumbers can repair your existing faucets or replace them with brand-new modern faucet sets. From kitchen and bathroom fixtures to shower and tub fixtures, count on us. 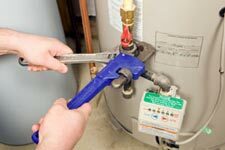 Hot Water Heater Repairs & Replacement – If your hot water heater isn’t working or leaking, our skilled plumbers can quickly make repairs or install a replacement water heater at competitive prices. Toilet, Tub & Shower Replacement – Count on our professional handyman services for these tough jobs. Update your major bath fixtures for a new look and improved, water-saving performance. Appliance Installation & Replacement – If your dishwasher or garbage disposal needs replacement or you want to install a brand new one, call HandyQuick! We’ll get the job done right without breaking your budget. New Plumbing Installations – Count on the expert plumbers from our Twin Cities handyman service to install new plumbing for your washer and dryer, a brand new bathroom in your basement, or when you remodel your kitchen. Plumbing Replacement Installation – If your house is older and your old plumbing has low water pressure and flow, your pipes may be plugged with hard water deposits. Our plumbers can install brand new plumbing in your home. Frozen Pipe Prevention – If, for some reason, you need to close down your home or rental property during the winter months, call our home maintenance and repair company. We can prepare and drain your plumbing system properly to prevent costly damage. This service is called “Winterization” and it can protect your home from damage if your furnace goes out in the winter. Many times “Snowbirds” have neglected to have their homes winterized during their extended stay to their winter homes in the south. We offer an affordable, fast and easy winterizing service that will drain all of your plumbing so you don’t lose any sleep. At our Twin Cities Handyman service company, plumbing problems are some of our most frequent calls. Our network of experienced, professional trade specialists includes skilled plumbers who are on call to solve any residential plumbing problem, including emergency repairs. Our plumbing services are affordable in price and our service is prompt. Our courteous, neat plumbers get your job done efficiently and leave your home clean and tidy. Just call HandyQuick and your plumbing problems are over.